These are great collectibles and display items. OUR NEW 16TH CENTURY GERMAN BATTLE AXE BRASS FINISH Features a half moon blade with embossed details. Length: 29.5, Weight: 2 lbs with Nickel Finish Accent. OUR NEW 16TH CENTURY GERMAN BATTLE AXE NICKEL FINISH Features a half moon blade with embossed details. 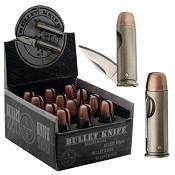 Length: 29.5, Weight: 2 lbs with Nickel Finish Accent. 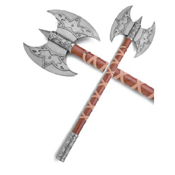 Click Here To See Details and Product Options Valkyrie's Battle Axe. 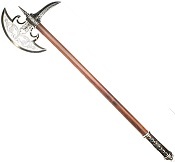 VALKYRIE'S FANTASY BATTLE AXE: Used by the warriors who served Odin and led the souls of the dead heroes to Valhalla. 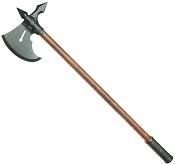 8" X 8" axe head with 22.6" leather wrapped handle with metal fitting. Length: 28", Weight: 3lbs. Great Movie Prop, Stage Prop or for collecting or Display. 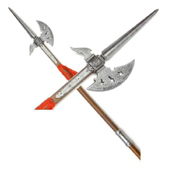 This Viking battle axe was a favorite fighting Weapon of the Scandinavian Warriors of the 8th Century. It features a 12? zinc blade with detailed engraving. Weighs 6 lbs.